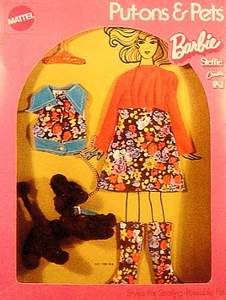 Barbie's black poodle has a turquoise blue faux suede collar and handle on the gold chain leash. The ensemble is a long sleeve dress with a plain red top and black floral skirt. The vest matches the skirt of the dress and is also trimmed in the same turquoise blue faux suede as the poodle's collar and leash handle. The boots are just wild. This is one of three ensembles from a group called Put-ons 'n Pets. They include an ensemble and a pet for Barbie. They are all hard to find. The other two are Kitty Kapers and Hot Togs.